Residents have given overwhelming backing to a £55m regeneration scheme for an historic Lincolnshire landmark. Hundreds of people took part in public consultations over the future of Sleaford's Bass Maltings, with about 90% backing the project. More than 75% wanted a cinema to be incorporated into the complex, which is likely to be converted into a housing, business and entertainment development. Project bosses hope work could begin in the coming months. Nearly 1,000 people attended meetings or workshops, or sent in questionnaires giving their views on the regeneration. Project manager Peter Bright said: "This is a massive response. "It is really encouraging to see that so many people are behind the moves to make something happen there, for the good of the town and the region. "Over 90% of the respondents agreed or strongly agreed that the Maltings should be regenerated as an integral part of Sleaford. "There was very little support for the demolition of the site. Most of the respondents call for a mix of uses." 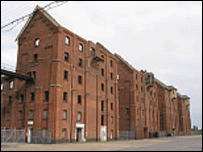 Malting operations at the Grade II listed building stopped in 1960. The buildings were then used to house chickens, but are now empty.